ADDIS ABABA , Jan 1 2013 (IPS) - Innovative Ethiopian footwear manufacturer Sole Rebels will open its second retail outlet in Taiwan this year. With ambitions to open 30 more franchise stores across the world in countries like the United States, Australia, Italy and Japan, Sole Rebels, the largest African footwear brand, is now fast becoming a global competitive brand. The company currently sells its innovative range of artisan shoes made from recycled materials in 55 countries and is now one of Ethiopia’s thriving businesses with a major presence on e-commerce sites such as Amazon. Its success reflects this Horn of Africa nation’s growing footwear-manufacturing industry as Chinese businesses are increasingly investing in the sector here. 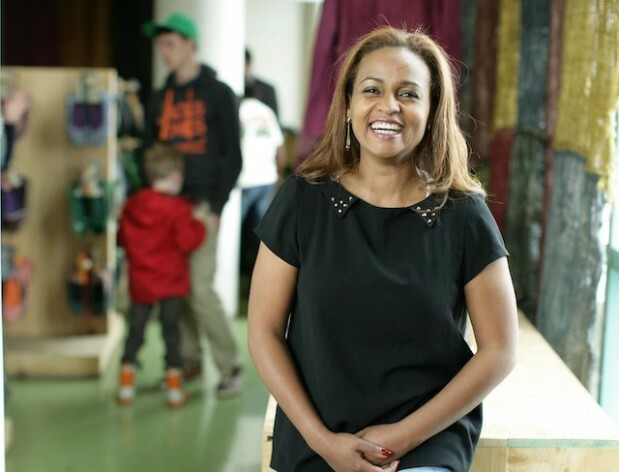 Founded in 2005 by Ethiopian entrepreneur Bethlehem Tilahun, who wanted to create jobs and sustainable prosperity in her country, Sole Rebels made two million dollars in sales in 2011 and is expecting to generate over 15 to 20 million dollars in revenue by 2015. “We are extremely excited to open a Sole Rebels store in the heart of Taichung. Taichung is a footwear epicentre, home to the Asian design centre for the planet’s largest footwear brands,” Bethlehem told IPS. The new outlet expands the company’s plan to exploit increasing consumer demand in Asia’s mushrooming retail footwear market and makes it the first African consumer brand to open franchise retail outlets in Asia. Bethlehem is intent to defy the stereotypes about her country. A poverty index released by Oxford University and the United Nations in 2011 ranked Ethiopia as the world’s second-poorest country after Niger. But the success of Sole Rebels is evidence of how Ethiopia is ready to make a transition from being foreign-aid reliant to being able to direct its economic future by exploiting home grown skills, resources and the many business opportunities in the country, according to Bethlehem. “Sole Rebels is proud to be the planet’s fastest-growing African footwear brand and the very first global footwear brand to ever emerge from a developing nation. It stands as living proof that creating innovative world-class brands is the best road to greater shared prosperity for developing nations like Ethiopia,” Bethlehem said. Sole Rebels is the world’s first certified fair trade footwear company. All of the shoes are hand crafted by a staff of over 100 people using traditional Ethiopian artisan practices and locally-sourced, hand-spun organic cotton and recycled materials. In a market where the majority of footwear brands are produced by machines, Sole Rebels shoes are a breath of fresh air. “Our business model centres on eco-sensibility and community empowerment. Our model maximises local development by creating a vibrant local supply chain while creating world class footwear,” Bethlehem said. Bethlehem, who was on the front cover of Forbes magazine in January 2012 where she was listed as one of Africa’s most successful women, has won many plaudits and a significant amount of international recognition for her work at Sole Rebels. She is now one of Africa’s most recognisable female entrepreneurs. Female entrepreneurship is, according to the World Bank, higher in Africa than in any other region of the world. In 2011, the World Economic Forum selected her as a “Young Global Leader”. In June 2012, she won the award for “Most Outstanding Businesswoman” at the annual African Business Awards organised by African Business Magazine. Eugene Owusu, Ethiopia’s representative at the United Nations Development Programme, told IPS: “Sole Rebels is taking advantage of the improving infrastructure and growing local skilled labour to exhibit all of the characteristics one looks for in Ethiopian entrepreneurs. The International Monetary Fund (IMF) reported that Ethiopia’s economy grew at a rate of 7.5 percent in 2011. This second-most populated country in Africa has been one of the fastest growing, non-oil producing economies in Africa in recent years, according to the World Bank. The country’s export earnings increased by 15 percent to 3.2 billion dollars between 2010 and 2011, according to the Ministry of Trade and Industry of Ethiopia. The government aims to double exports as a share of economic output by 2015 with a much bigger contribution coming from the sale of minerals and manufactured goods. Owusu said Ethiopia’s booming private sector would help the country continue with its growth trajectory and this should translate into poverty reduction and national development. “Locally-grown private enterprises will be a foundation from which Ethiopia can consolidate the strong overall growth exhibited over the last decade, and to achieve the bold transformative vision that the country has set itself to become a middle-income country by the year 2025,” Owusu said. Chinese manufacturers, particularly footwear manufacturers, are now starting to relocate production facilities to Ethiopia to escape rising production costs at home, but also because Ethiopia has one of the largest livestock industries in Africa to supply leather to producers. Ethiopia also boasts one of the largest and cheapest labour forces in Africa. Ethiopia’s late Prime Minister Meles Zenawi wanted the country to become a major producer and exporter of leather shoes as part of his economic development plan. Chinese company, Huajian Shoes, announced in 2012 that it would invest two billion dollars in Ethiopia’s footwear manufacturing industry. To date, Chinese companies have invested 900 million dollars into Ethiopia’s economy, according to Ethiopia’s Investment Agency. Zemedeneh Negatu, a managing partner at Ernst & Young in Ethiopia, thinks that companies like Sole Rebels will help transform the economic landscape of Ethiopia and the continent. “The company’s success is an inspiration to the newly-emerging Ethiopian private sector. It’s important to remember that until 1991, Ethiopia was a pseudo-socialist country with no private sector. Yet in a relatively short time it has started to produce success stories such as Sole Rebels, which is a good example of an export-oriented global success story from the private sector.